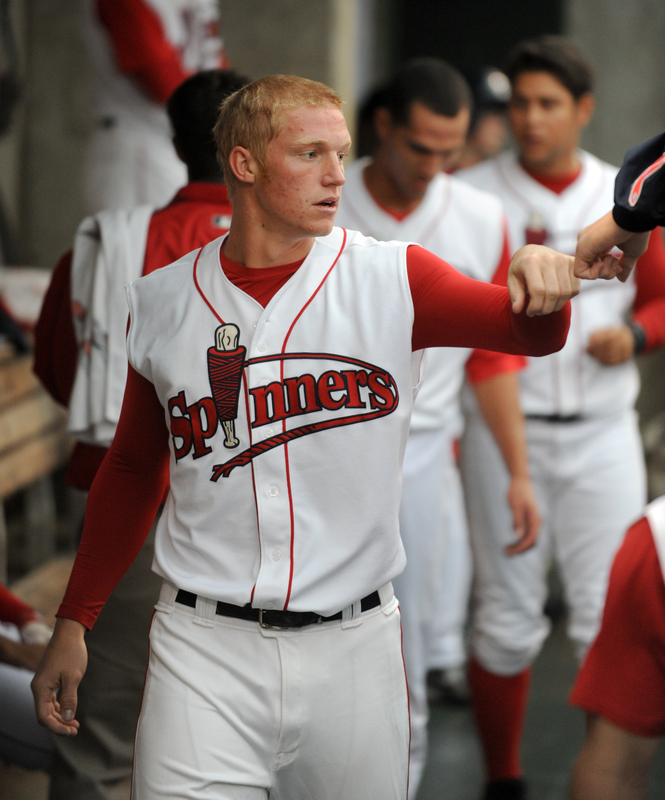 Topping many Red Sox prospect lists this offseason is soon-to-be 20-year old outfielder Ryan Westmoreland. Drafted in the 5th round of the 2008 amateur draft as an over-slot pick out of Portsmouth High School in Rhode Island, the athletic Westmoreland is looking like an amazing steal. The native New Englander is, as they say, a veritable toolshed and has made short work of everyone he has faced, combining contact, on-base and power into a very appealing package. The youngster was also quite the pitcher in high school, pitching a perfect game in which he struck out 19 of 21 batters, so you know he’s got a cannon for an arm. He passed up a scholarship at Vanderbilt University to sign with Boston. In his first full professional season at Single-A Lowell, coming off labrum surgery, Westmoreland slashed .296/.401/.484 as a 19-year old. There was seemingly nothing he couldn’t do, as he amassed 25 XBH in 223 AB and stole 19 bags without being caught once. He showed a very mature approach at the plate, being selective and walking over 14% of the time, while also keeping the strikeouts in check at 18.4%. The only thing that could set him back, as it turns out, was a broken collarbone, suffered when he crashed into the centerfield fence on a play late in the year. And yes, he made the catch. Westmoreland is a wiry strong 6-2, 212 and he’s still filling out. Ultra-fast on the basepaths, and he uses his agility well in the field. He’s one of those naturals in the outfield, and he’s a smart player. While he can play all outfield positions now, with his strong arm he will likely profile as a very athletic right fielder if he grows much more. He uses an open, slightly crouched stance from the left side of the plate, and has shown good pull power already (see his spray chart below, courtesy minorleaguesplits.com). He still uses the whole field pretty well though. Now fully healthy, Westmoreland will be starting off at Single-A Greenville and if all goes well, he will make the jump to Double-A Portland. His line was buoyed by a .353 BABIP last season, but that’s not so unusual when advanced players dominate their competition. He’s also got to make some more strides at the plate- as with most young hitters, his split against LHP was weaker, only .257/.378/.378, while he punished righties to the tune of .318/.415/.541. Once he hones his approach against tough breaking stuff from lefties, he should be a valuable asset to Boston for many years to come. I know it’s a lot of fun drooling over prospects, but don’t get too excited yet. Westmoreland’s Major League Equivalent line for Single-A reads something like .197/.265/.299, so he’s still got a ways to go. Once he fills out, we could be looking at a very good center/right fielder with 25 HR power and 20 SB. Kevin Goldstein lists his comparable as Grady Sizemore, which is always nice. His continued development is critical to our future success, as we have a lot of veterans who may be signing large deals over the next few years (Josh Beckett, Victor Martinez, etc). 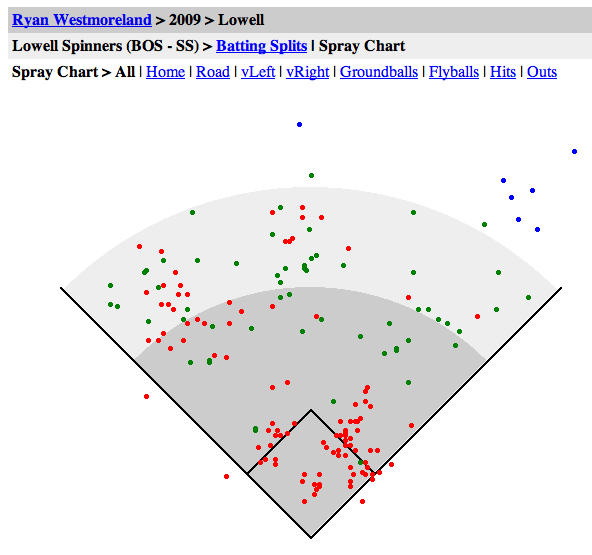 We should see Westmoreland in a Red Sox uniform by 2013, but at this rate of development, that could be pushed up a season. hOur company provides herbal health and related products. Visit our health contributing site in case you want to look healthier. Our company offers healthcare products. Take a look at our health contributing site in case you want to look healthier. Our company offers a wide variety of non prescription drugs. Visit our health website in case you want to strengthen your health with a help general health products. Our site offers a wide variety of non prescription drugs. Visit our health portal in case you want to to improve your health with a help of health products. Our company offers supreme quality pharmacy. Look at our health contributing site in case you want to feel healthier. Our company offers herb-based weight loss products. Take a look at our health contributing website in case you want to feel healthier. Our site offers a wide variety of non prescription drugs. Look at our health portal in case you want to look better with a help health products. Our company offers a wide variety of non prescription products. Visit our health site in case you want to to improve your health with a help of generic supplements. Our company offers herb-based pills. Look at our health contributing portal in case you want to look healthier. Our company offers a wide variety of non prescription products. Visit our health portal in case you want to to feel healthier with a help generic supplements. Our site offers a wide variety of non prescription products. Look at our health site in case you want to feel better with a help of general health products.